Last night I headed out to the Marketing Hall of Fame Induction Ceremony, organized by the New York American Marketing Association. Full bios at the end of the post. All the four inductees offered the audience interesting insight into their careers, where they see marketing heading, and their leadership styles. Several themes stood out to me during their acceptance speeches. Technology and Leadership – Marketing has evolved faster than any other industry or business function out there. Being able to keep on top of the latest technology is an imperative for all marketing leaders. It’s no longer enough to hire Millennials with technology skills, leaders need to understand how these new tools could impact growth, thus making smarter decisions. Jim Stengel actually touches upon this in his new book Unleashing the Innovators: How Mature Companies find New Life with Startups. In it he discusses how legacy companies have partnered or acquired startups to infuse technology and innovation into their businesses. WalMart’s acquisition of Jet.com and subsequent hiring of Marc Lore as CTO is a key example. Authenticity – Marketing has to be personalized. Brands need to tell an authentic story that engages with consumers. It’s too easy to spot bullshitters in this digital age. 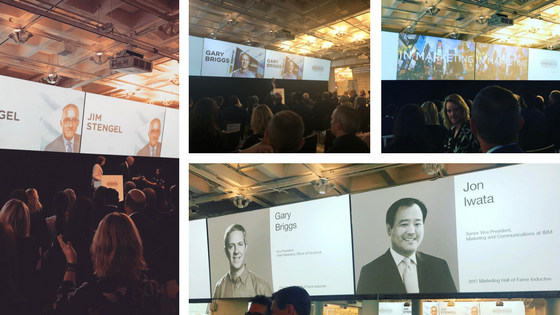 Fostering environments for Growth – it was humbling to see that all 4 inductees see their greatest achievements as having been encouraging others in the field to reach their potential. Each noted that by fostering an environment at work that opened up conversations around new ideas, offered a safe space to experiment and fail, had the greatest impact to the team’s overall successes.